Safety Supplies Direct started in 2006 as a division of Tawsa Ltd health and safety consultancy. 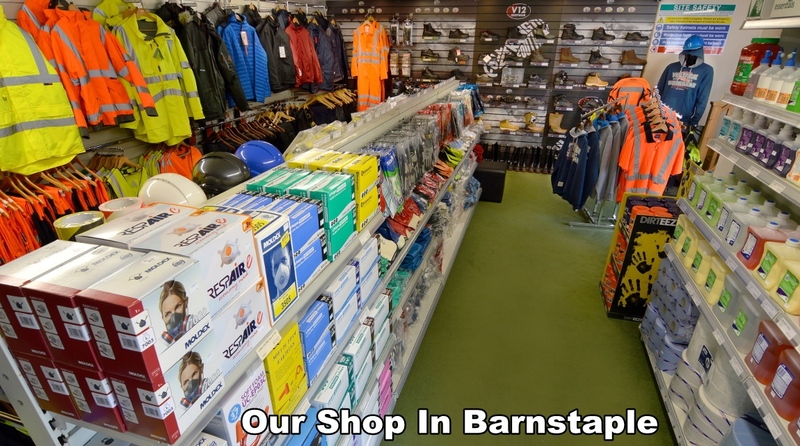 Our shop in Barnstaple stocks and supplies a wide range of health and safety clothing and equipment, as well as janitorial supplies. We supply trade, businesses and the general public. Safety Footwear – Safety footwear does more than just protect your toes, it can also help protect you from falling over on slippery surfaces such as Kennedy Grating and wet scaffold boards, it can give you protection from penetration of the sole by sharp objects, also most safety footwear now has sole heat resistance to 200 or 300oC. S1 – as SB plus closed energy absorbing seat region and antistatic. S3 – as S1 plus penetration resistance and cleated sole. SRA – slip resistant, tested on ceramic tile wetted with dilute soap solution. SRB – slip resistant, tested on smooth steel with glycerol. SRC – slip resistant, tested under both the above conditions. WR – whole footwear resistance to water penetration. Full Guidance can be found on the HSE website here. Protecting your feet has never been more of a pleasure! gone are the days a heavy uncomfortable boots that took forever to break in, many of our work boots and shoes now feature composite materials instead of steel, as well as waterproof membranes and comfort insoles. Safety Trainers and Safety Trainer Boots are increasingly popular and often the only real difference between them and the ones you by buy in a sports shop is the protection factor. We are proud to be a Premium Stockist of the V12 range of safety footwear, which we believe offers exceptional value and performance. V12 is a UK company who's safety boots are highly regarded by our customers. The quality of V12's high end footwear is easily comparable to that offered by the likes of Timberland, CAT and Dewalt. V12 also offer stylish safety shoes and a popular range of safety trainers. We are also stockists of a good range of Dr Martens, Himalayan, and many others. Hi Visibility Clothing – Nowadays hi visibility workwear does not just mean hi vis waistcoats and bomber jackets, it is available in a huge range of items including sporty polo shirts which would not be out of place in the gym and trendy hi viz hoodies that still comply with ISO 20471 requirements. We are one of the UK’s leading suppliers for Leo Workwear, a UK company with over 30 years of innovation and experience. We also stock Portwest workwear. Eye Protection – Protective eye-wear has also evolved, safety glasses and goggles are now more stylish, light weight and functional than ever. Products such as the Bolle Tracker now provide an alternative to traditional safety googles. We supply Bolle, 3M, JSP, Beeswift and many other brands. Respiratory Protection – Dust masks (particulate respiratory protection) for airborne liquids in the form of fine sprays and mists and solid materials, including dusts, fibres, smoke and fume are available as reusable respirators such as the Moldex 7000 half mask that can be fitted with filters to your requirements and disposable masks like the Respair FFP3V . Although hazards from asbestos dust and silica dust (such as concrete) are well known, you also need protection from all wood dusts. Please bear in mind that Particulate filters do not provide any protection from gas or vapour. Protection from many forms of organic vapour such as solvents and some gases can be achieved by the addition of the correct cartage to our range of reusable masks see here . Gas and vapour filters do not protect against particles, to do this you will need to add the appropriate dust filter such as this P3 filter . When choosing the appropriate filters/masks always refer to the Material Data Sheet/s for the products you are using. These can usually be obtained from the manufacturer’s website. We keep a large range of dust masks and filters in stock at all times, and can also advise you on face fit testing which is now a requirement for employers. We are one of the Southwest’s leading suppliers of Moldex masks and filters. We also stock Portwest and 3M. Hearing Protection – Too much noise can cause permanent and disabling hearing damage. How much noise it too much? Less than most people think, the HSE advice is that the equivalent of a busy street is too much noise if you have it for most of the working day. Although we would always advise a noise survey to ensure you get the correct protection level. You can also have too much protection which gives the wearer “isolation” preventing them from being able to hear danger. The effectiveness of ear protection is measured using an SNR rating (Single Number Rating) The higher the number the more protection. For example if the ambient noise is 99dB using ear protection with an SNR of 21 would reduce the dB to 78. The HSE advise that the level should be below 85dB at the ear. We stock a wide range of hearing protection for the individual with ear defenders and ear plugs from Moldex, 3M and UC Ear. More guidance can be found here on the HSE website. Working at height and rescue from height - We stock a range of body harnesses, lanyards, fall arrest systems and accessories from P+P one of the leading British designers and manufacturers of safety harnesses and equipment. Printing & Embroidery Services – We offer a competitive printing and embroidery service to help create a professional image for your company.